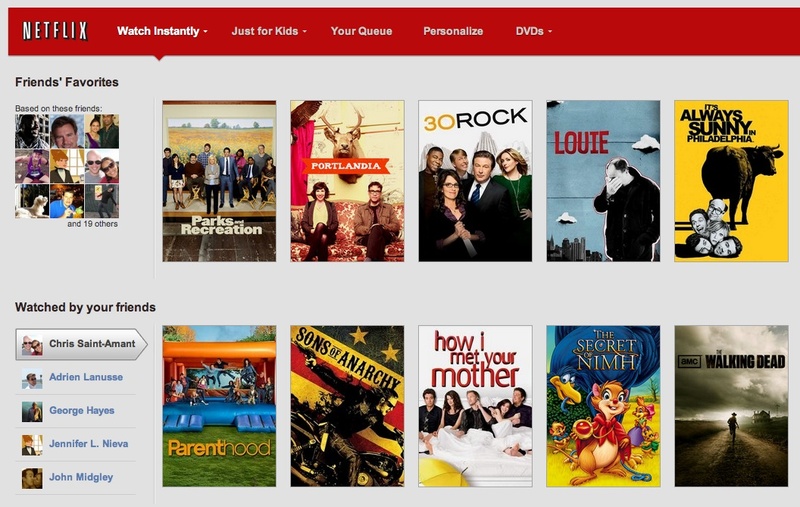 Ever wanted to know what your former college roommates are watching on Netflix? Now you’ve got your chance: Netflix (s NFLX) plans to turn on its Facebook (s FB) integration for U.S. subscribers Wednesday, allowing them to share their viewing behavior with their Facebook friends and get social recommendations for what to watch next. The integration followed some political wrangling about a little-known 1980s privacy law. Subscribers who opt in will see what their friends watch and like (click to enlarge). U.S.-based Netflix subscribers can now connect their Facebook account to the video service, and then be able to view dedicated categories called “Friends’ Favorites” and “Watched by your friends” on the Netflix website as well as through the company’s apps on mobile and connected devices. Viewers can also opt into sharing all of their viewing behavior on Facebook’s website. There are some privacy provisions that are supposed to prevent over-sharing: Subscribers who opt into sharing their viewing data with Facebook can prevent the sharing of a title “by clicking Don’t Share This during the first few minutes of playback on most devices,” according to a Netflix help page. Titles that have already been shared can also be unshared — but cautious users may just want to turn off sharing altogether before they embark on some late-night B-movie binge viewing. Netflix first rolled out its Facebook integration in Canada and Latin America in late 2011, but bringing the feature to the U.S. was complicated by a 15 year-old privacy law called the Video Privacy Protection Act. That law was meant to prevent video rental stores from releasing data about the VHS tapes a customer rented, but it also prevented Netflix from sharing data with one’s Facebook friends. Netflix lobbied heavily to change the law, and Congress eventually amended it earlier this year, giving Netflix an opportunity to add Facebook integration for its U.S. customers as well. Facebook. Yippee. I don’t care. And sharing on Facebook doesn’t mean you get to share with who you want to anyway. Facebook controls that. This needed to come out after they’d allowed different profiles for each Netflix account. My girlfriend and I share a Netflix account – a not uncommon event – and thus this becomes a feature that can only be utilized (poorly) by one of us. Barrett, that’s a good point. I think they might follow up with profiles soon. I agree with Barrett too. Except I don’t care about Facebook. I am not on it, nor do I ever plan to be. And I don’t plan on sharing what i watch (or my wife and 2 sons watch on my account). It’s about time! I have been waiting for Netflix to be more social with it’s members and content for a long time. I always thought it could be fun to share what you’re watching, comment on movies or shows and maybe even participate in some level of gamification. Will be nice to see where Netflix takes this, looking forward to it. I don’t understand why they made it “social” with the help of Facebook, instead of reverting to the original profiles that Netflix had used before. I liked being able to sift through comments and watch the movies people who I agreed with liked. Now it’s going to be meshed in with the online status-journal that is Facebook. It’s not as streamlined and frankly, it’s a pointless integration. Netflix/Facebook integration has been available in Canada for a while. My dad stumbled into it unintentionally and was so upset that he deleted his Facebook account. It will be interesting to see if people actually want everyone to know what they’re watching, or if the creep-factor will be too much.